HYDERBAD, Sep 28 2018 (IPS) - It has been six and half years since the killing of Bangladeshi journalists Meherun Runi and Sagar Sarwar in Dhaka. Runi, a senior reporter from the private TV channel ATN Bangla, and her husband Sarwar, news editor from Maasranga TV, were hacked to death at their home on Feb. 11, 2012. Years later, with no official updates on the progress of the investigation, their families wait for justice as the fear of impunity looms large. The atmosphere in Bangladesh’s journalism today is one of trepidation and caution. It has witnessed a series of attacks against students and journalists in the capital city of Dhaka, followed by the passing of a cyber law that has come under scathing criticism. The Digital Security Bill 2018, passed on Sept. 19 has been strongly criticised by journalists, who have called it a tool designed to gag the press and freedom of speech. The draft bill had been actually introduced last year, and there had been strong demands for amending several provisions of the law. The government had publicly promised to consider the demands. However, on the advice of the law makers, the government decided to go ahead without any changes and passed it last week. 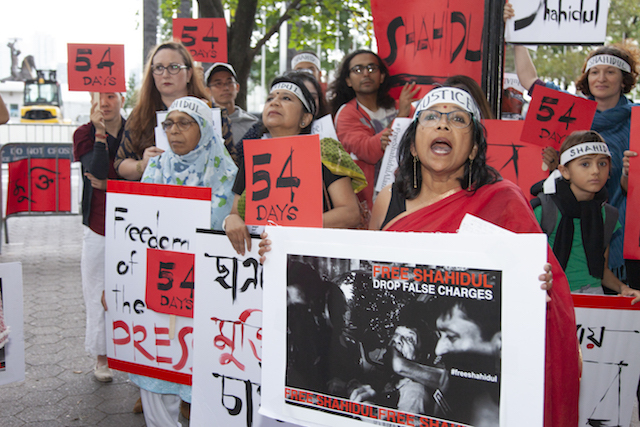 IPS Journalists worldwide stand in solidarity for press freedom and join the Nobel Laureates and 17 eminent global citizens, and British MP Tulip Siddiq as they call for the immediate release of Shahidul Alam. IPS also calls for the release of journalists who have been detained in the course of duty across the globe, including those in the Congo, Turkey, and Myanmar. IPS has noted with concern the increasingly repressive environment that our reporters are working in and call on governments to review their media laws and support press freedom. It is incredibly important for IPS that our reporters are safe as they do their work in holding governments and institutions to account. One of the most worrying provisions of the law (section 43) is that it allows the police to arrest or search individuals without a warrant. Other provisions of the law includes 14 years of imprisonment for anyone who commits any crime or assists anyone in committing crimes using a computer, digital device, computer network, digital network or any other electronic medium. As expected, the new law has come under scathing criticism of the media. “The act goes against the spirit of the Liberation War. Independent journalism will be under threat in the coming days. We thought the government would accept our [Sampadak Parishad’s] suggestions for the sake of independent journalism, freedom of expression and free thinking, but it did not,” said Naem Nizam, editor of Bengali news daily Bangladesh Pratidin, in a strongly-worded public statement. The Editor’s Council, known as Shampadak Parishad, also was unanimous in labelling the law as a threat to press freedom and independent media in the country. To protest against the law, the council has called all journalists and media bodies to join a human chain on Sept. 29 in Dhaka. The legislation “would violate constitutional guarantees of freedom of the press, and would create extensive legal dangers for journalists in the normal course of carrying out their professional activities,” Steven Butler, the Asia programme coordinator of the Committee to Protect Journalists (CPJ), said in a statement. Interestingly, the new law was originally developed in response to the media’s demand for scrapping Section 57 of the Information and Communication Technology (ICT) Act, 2006—a broad law against electronic communication. Under Section 57, intentionally posting false, provocative, indecent or sensitive information on websites or any electronic platforms that was defamatory, and can disrupt the country’s law and order situation, or hurt religious sentiments, is a punishable offence, with a maximum penalty of 14 years imprisonment and a fine of USD120,000. It was under this section 57 that Shahidul Alam, an award-winning independent photographer, was arrested. Alam was arrested on Aug. 5 from his home in Dhaka and has been charged with inciting violence by making provocative statements in the media. He has been held without bail since the arrest, despite repeated appeals by the media, human rights groups and the international community for his release. IPS contacted several local journalists and academics but everyone declined to comment on the issue of Alam’s arrest. However, last month, British MP Tulip Siddiq, and the niece of Bangladesh prime minister Sheikh Hasina, called on her aunt to release Alam saying the situation was “deeply distressing and should end immediately”. Alam’s family organised a protest in New York on Sept. 27 to coincide with prime minister Hasina’s address to the United Nations General Assembly. The protest was endorsed by human rights groups and journalist associations, rights activist Kerry Kennedy, actress/activist Sharon Stone, and attended by Gayatri Chakravorty Spivak, among others. According to Meenakshi Ganguly, Asia director of Human Rights Watch (HRW), the Bangladesh government wants to show that no one who dares criticise or challenge its actions will be spared. “Newspaper editors face being charged with criminal defamation and sedition. Journalists and broadcasters are routinely under pressure from the authorities to restrain criticism of the government,” Ganguly said. “As a photographer, Alam documents the truth; his work and his voice matter now more than ever,” she said. 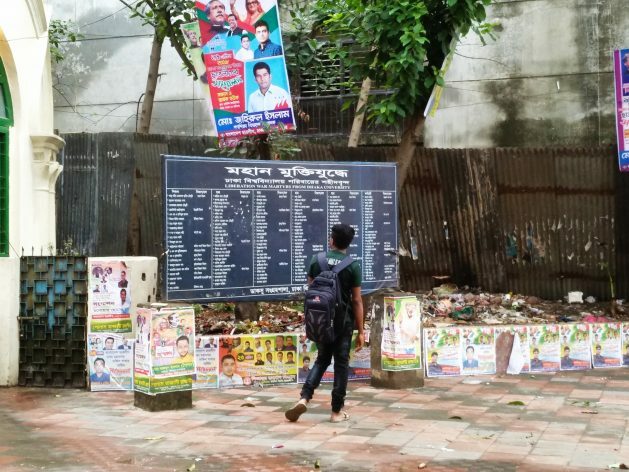 In Bangladesh, the media has been demanding the scrapping of Section 57, explains Afroja Shoma, an assistant professor of Media and Mass Communication at American International University of Bangladesh. “However, the Digital Security Act left this untouched and so this new law is nothing but ‘old wine in a new bottle,’” Shoma told IPS. “Section 57, in the past, has been misused several times. The media wanted the government to scrap this. The government then brought this whole new law [the Digital Security Bill 2018]. But it has retained the same old provisions of the section 57. As a result, the law has created an atmosphere of fear among the journalists of the country,” said Shoma. However, digital laws are not just threatening press freedom in Bangladesh. Several countries in south Asia have had similar punitive laws passed. India had its own “Section 57” known as the Section 66A of the Information Technology Act 2000. However, of late, India has also seen a spate of vicious attacks on journalists. These include the murder of journalists Gauri Lankesh and Shujat Bukhari as well as online attacks on investigative journalist Rana Ayyub who authored the book Gujarat Files. No arrests have been made in any of these cases so far. Nepal, a country not known for attacks on the press, has just passed a new law that makes sharing confidential information an offence resulting in a prison sentence. The code criminalises recording and listening to conversations between two or more people without the consent of the persons involved, as well as disclosing private information without permission, including private information on public figures. Under the law, a journalist could face fines of up to 30,000 rupees (USD270) and imprisonment of up to three years, according to the CPJ. The CPJ has released a statement asking the government to repeal or amend the law. Pakistan, which ranks 139 in the Press Freedom Index (India ranks 138, while Bangladesh and Nepal rank 146 and 106 respectively), has witnessed the killings of five journalists while working between May 1, 2017 to Apr. 1, 2018. • and 23 occurrences of verbal and written threats. The country has just, however, drafted the Journalists Welfare and Protection Bill, 2017, which aims to ensure safety and protection of journalists. The draft, once adopted, will be the first in the region to provide physical protection, justice and financial assistance for all working journalists—both permanent and contractual. There is a glaring omission from this article: the IPS has just last week given Sheikh Hasina its 2018 international Achievement Award. The Bangladeshi government can now celebrate being given a seal of approval by the IPS having just enacted this new law and after years of harassment, arbitrary arrests, torture and imprisonment of journalists – as documented above. Unfortunately the article is therefore absurd.